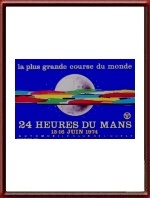 Vintage Original 1974 24 Hours of Le Mans Poster. June 15 & 16, 1974. The 1974 Le Mans poster is part of the "The Global Appeal of the Race" era in Le Mans posters which lasted from 1972 to 1974. 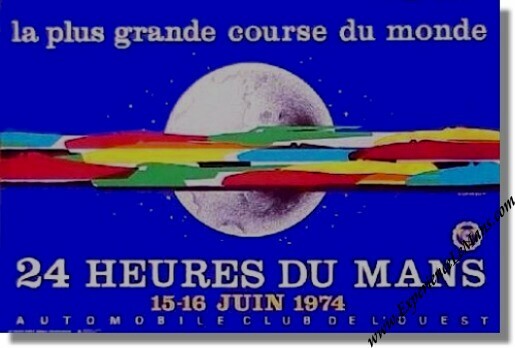 The idea of putting the global appeal of the race on the poster stems from the graphic aspect of design of the program cover for the 1973 race. The 1974 illustration, by Jean Jacquelin, adds the notion of a planet-wide event. The Le Mans 24 Hour race is now amongst the greatest races on earth! Design and production were in the hands of the Le Pilier Vert agency from Le Mans.